As health care shifts toward value-based reimbursement with a heightened focus on population health, the main challenges for HIM center on leadership and change management. Feedback from the field suggests that many HIM professionals are not prepared to assume an active role in the value-based arena. This is a pivotal time when the profession should be thinking strategically in the direction of value-based care, bundled payments, and other emerging trends. While HIM realizes the importance of improved coding practices as a means of ensuring data integrity, the conversation must broaden and transition into action. There's a sense of knowing what should be done—looking at populations, identifying patterns—but, in reality, others in the organization are taking the lead. HIM must move beyond "knowing" to figuring out the "how" within the organization. This means being well informed, contributing value, and getting a seat at important meetings with executive leadership and multidisciplinary teams. 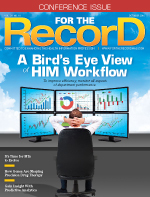 A decade ago, as IT directors began to look at EHRs, they were interacting mostly with physicians, not with HIM professionals—the experts on managing health information to ensure quality, transparency, accountability, and protection. HIM was not represented at the table. How can HIM professionals reinvent their roles and become embedded in the discussion? For example, they know the importance of data mapping—code sets, data elements, consistency across systems—critical to quality EHR data and reporting. Even so, HIM has yet to assume a leadership role. What's preventing this from occurring? In part, it's the company HIM professionals keep. Relationships tend to be more aligned with revenue cycle and less with quality, finance, and business analytics. While HIM and IT are beginning to forge a partnership, the former needs to get involved across the enterprise to gain an understanding of new projects. This requires networking beyond peer relationships to include professionals in other areas of expertise. Partnering with people who don't know what HIM brings to the table is a challenge. Consider population health as an example. HIM must do the research; examine high-risk, chronic populations; and engage others in the discussion. Focus on finding patterns while also looking for items that don't make sense in the data. Making the most of predictive analytics means being attuned to outliers that lead to breakthroughs, innovation, and new ideas. Point out issues related to data integrity and emphasize how HIM is ultimately responsible for maintaining it. Another strategy within population health involves building patient registries. Who better than HIM to be on the ground floor of this effort? Unless HIM expresses interest and takes the initiative, others will take the reins. HIM must be knowledgeable about current trends, organizational challenges, and goals. Being prepared to discuss essential topics and articulate the department's contributions will make its value known. According to Marina Theodotou, a multilingual business development strategist, there are four keys to gaining a seat at the table. The following is a summary of Theodotou's recommendations as they relate to HIM. • Read about your industry beyond your own discipline. Find out what other organizations are doing. Become conversant on the issues. Engage colleagues in areas such as quality assurance, IT, finance, and business analytics. Join the conversation on topics of interest, including population health and bundled payments. • Look up from your phone, laptop, or tablet, and face yourself in the mirror. Assess your strengths and weaknesses. Bring your authentic self to the table. Be truly comfortable in your own skin—more present, mindful. • Stand up and articulate what you stand for on important issues. Present what you think, value, and have to offer. • Speak up and make your voice heard. Say what's on your mind. Improve your public speaking skills. Develop the ability to listen and ask questions. HIM directors should be asking: "What are our organizational goals and strategies? What are the C-suite concerns?" Then, take an introspective approach: "What is my contribution? How can I show my value and make a difference?" Know your skills, interests, and experience; tap into your wisdom; and take action. This line of thinking can be utilized in many situations. For example, there's much discussion around the implementation of patient portals and how to best help users navigate the technology. From a broader perspective, clinical documentation and data integrity are center stage. Pick your topics and drill down to determine the goals in those areas, then figure out how you can help the organization reach those milestones. Information governance (IG) is ubiquitous, requiring staff from various disciplines to embrace its principles. Everyone at the table must decide what IG components represent their perspective. An HIM director must be more of a generalist, managing information from a broader view. At the director level, it's important to bring organizational structure to IG, advocate for its principles, connect with other advocates, and demonstrate how to partner with staff and create value. This may involve initiating multidisciplinary steering committees. Many of these groups form subcommittees aligned with IG principles such as transparency, accountability, protection, and compliance. One of the largest obstacles to widespread adoption of IG principles is getting staff to agree on its importance. Trust in information supports data integrity—arguably the most important organizational asset. Data accuracy affects virtually every facet of operations, including bundled payments, value-based reimbursement, and population health. While advocating for IG, HIM professionals must be patient and persevere even though the concept is not yet receiving the attention it deserves. From an outsider's perspective, ICD-10 is the face of HIM. Take advantage of that perception—incomplete as it may be—by helping others in the organization better understand ICD-10's ability to generate more granular data. In that regard, initiatives must be in place to ensure data integrity. One challenge to the implementation of such initiatives is finding ways to demonstrate the benefits of granularity and how it drives data integrity. Today's health care organizations possess more valuable data than ever before. From this mountain of data, trends and patterns can be spotted. However, HIM cannot do this alone. Collaboration with experts in business analytics is needed to make sure HIM is pulling the right data from the right places. Together, these cohorts can make the business case that more granular data are being generated and demonstrate how this information is helping to achieve organizational goals. However, skeptics will want more convincing evidence. Those planning health care delivery to a population may not be concerned with left and right granularity but they will care about a specific case of a child with asthma. In that regard, ICD-10 delivers unprecedented granularity of that diagnosis—and it comes straight from HIM. Right now, the health care industry is not paying too much attention to the quality of ICD-10 coding because providers are not receiving denials. But that will change. Once denials begin to occur, all eyes will turn to HIM, which must have intimate knowledge of the quality of the documentation and coding—no one wants to be blindsided. Predicting problem areas and where denials are emanating will be critical. To anticipate future challenges, HIM must deepen its knowledge of many trends and initiatives, including value-based reimbursement, privacy and security, population health, patient portals, IG, data analytics, clinical documentation improvement (CDI), and staffing shortages. CDI is a prime example of an area where HIM can make its mark; in fact, more CDI programs are reporting to HIM. If CDI initiatives are implemented narrowly around reimbursement and Medicare, a huge population will be overlooked. Taking action to address challenges and create opportunities requires strong HIM presence at the table. Consider the familiar saying, "If you're not at the table, you're on the menu." Don't wait for an invitation. Pull up your chair and participate. — Patty T. Sheridan, MBA, RHIA, FAHIMA, is the senior vice president of HIM services for CIOX Health.